Kompa Magazine • RICHARD CAVE KAI mande "NOU GINLE MALADE"? RICHARD CAVE KAI mande "NOU GINLE MALADE"? 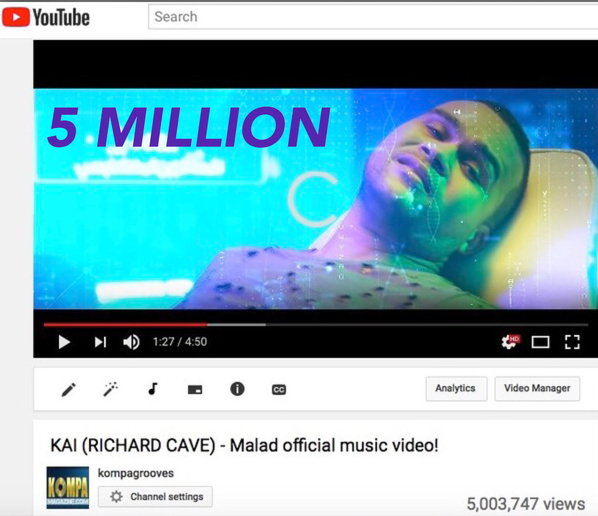 The "KAI "MALADE" train continues to jog along on our youtube KOMPAGROOVES channel...now reaching 5 MILLION VIEWS on the channel. Fanatic yo ginlè MALAD music video "MALADE" KAI la tout bon. CONGRATS TO KAI and thanks to the fans for tuning in. THE MOST VIEWED VIDEO on our channel's history still as we speak. Re: RICHARD CAVE KAI mande "NOU GINLE MALADE"?